Is there anything cuter than a toddler outfitted for the beach? Your child in a whimsical sunhat and swimsuit just needs some colorful beach shoes to make everyone smile. Of course, all the pieces should be functional as well as eye-catching, and the right beach shoes are an important component. You’ll want beach shoes that will protect your child’s tender tootsies – that’s most critical. Good fit and easy care are also important. Beach shoes come in several basic styles. The stretchy shoes that are sometimes called aqua socks or swim socks are one type. They aren’t really like socks, because they have a rubber sole, but they are snug and comfy like a good pair of socks. Some beach shoes are styled like sneakers but created in breathable fabrics like mesh. These provide good support and protection. In fact, some of them are fine for everyday wear. Injection-molded shoes such as the popular Crocs are also good for beach shoes. Another very popular style is the beach sandal. These are made from fast-drying materials and usually have Velcro-style fasteners. Beach shoes will protect your child’s feet from rocks and shells, as well as from the occasional bit of human litter. If the sun is hot, your child’s feet won’t burn like they would if they were bare. Little feet will be protected from jellyfish, crabs and other stinging or prickly sea creatures. Did I say that toddler beach shoes are also super cute? You’ll probably want to buy way more than your child really needs. Here’s a preview of the best toddler beach shoes. Beach shoes are also great for swimming pools, hot tubs, lakes and streams. If you are going to a theme park that has some water rides, beach shoes are a great choice, because they won’t stay wet all day. Just be sure to choose a style with good support. Some beach shoes are great in dry conditions. Some of them are suitable for other outdoor activities, and some can even be worn on an everyday basis. The aqua sock style is probably the least versatile because a child’s foot can slide around a good bit inside the shoe. The aqua sock can be worn while swimming, however, due to its minimal weight. Although several factors will determine the best beach shoe for your child, here are some general characteristics to look for. Fast-Drying Uppers. The material may be mesh or simply a lightweight synthetic, but you’ll want shoes that will dry quickly so your child doesn’t have to wear wet shoes. Non-Slip Soles. You may opt for rugged soles or for a smoother pattern, but all beach shoes should have non-slip soles. After all, they’ll be worn in bathrooms, changing rooms and other areas that get slippery. Air Circulation. Some models are made of a mesh material, and some have cut-outs for ventilation, but all beach shoes should allow for air circulation, to speed drying and to banish odors. Good Fit. You’ll want a shoe with features that ensure a good fit, such as stretchable fabric, straps and elastic cords. One more hint: Before you buy, put your fingers inside the shoe and feel for rough edges and protrusions. Toddlers’ tender skin can easily be rubbed raw. Which Style Shoe is Best? When it comes to beach shoes for your toddler, one size doesn’t fit all. In fact, one style doesn’t fit most. Which shoe is best will depend upon the following factors. Your Child’s Age. The younger the child, the more he or she will need a shoe style that provides good support. Thick soles can be a problem for children who haven’t been walking for very long. The Activity. Certain shoe styles are best for particular activities. Aqua socks are good for swimming and for hanging around poolside or on smooth, sandy beaches. Sneaker styles and sturdy sandals are good for rocky beaches, lakes and streams. Ease of Wearing. If the shoe you pick out for your child is easy to put on, you’ll be a happier parent. You’ll be happiest if your child can put them on without help. Your Child. If you have a rough-and-tumble child, you’ll need sturdier shoes than if you have a cautious child. Toddlers probably shouldn’t wear flip-flop or slides for active play, because they can be a tripping hazard for children who haven’t been walking for that long. When kids are older, however, flip-flops may be fine for occasional wear, because a child’s walking style in flip-flops is quite close to barefoot walking, which is best for foot development. Many doctors recommend barefoot walking for children when they are in an environment without a lot of hazards. It’s always tempting to buy children’s shoes extra large because they outgrow them so quickly. This is seldom a good idea, and it’s a bad idea for beach shoes. As shoes get wet, they get heavier, and they will be likely to either come off your child’s foot or else slide around and cause blisters. When buying beach shoes, you should follow the basic steps for fitting any shoe. Put both shoes on your child. Most people have one foot that is larger than the other. Feel the ends of both shoes. When shoes are new, there should be about a thumb’s width of room at the end of the shoe. Feel for the little toe at the side of the shoe. You should be able to feel it, but it shouldn’t be shoved tightly against the side of the shoe. Slide your finger between the back of the heel and the shoe. The fit should be snug, or the shoe will slide up and down and make a blister. Have your child walk in the shoe and ask if it hurts. Sometimes fit problems can’t be seen, but can be felt. If you are wondering if your child has outgrown his or her shoes, here’s a trick to check. If there is a removable insole, take it out and have your child stand on it. If his foot is hanging off the insole in any spot, he has outgrown the shoe. When children are very young, they will outgrow a pair of shoes in around two months. This rate of growth slows down, however, and most children over three will take four to six months to gain half a shoe size. Badly fitting shoes can cause problems such as ingrown toenails, blisters, and bunions. In the United States, children’s shoe sizes can be confusing, because they start with 1 and go to 13, then they start over again at 1. A one-year-old and an 11-year-old may both wear a size five, but one is a children’s size 5, and one is a youth size 5. The majority of one-year-olds wear a 5 or a 6. Most two-year-olds wear a 7 or 8, and most three-year-olds wear a 9 or 10. Many times, girls wear one shoe size smaller than boys of the same age. Of course, children who are small for their age will probably need shoes that are smaller than average, and larger children will need bigger shoes. There really is no substitute for trying on shoes. High-quality children’s shoes come in half sizes. Economy brands often offer whole sizes only, because skipping half sizes saves the factory money. Many times an economy brand will fit your child just fine, but if your child is between sizes, you may have to go to a more expensive brand in order to get a good fit. You will also see shoes offered in what is called double sizes, such as 1-2, 3-4 and 5-6. This type of sizing is often used for items such as rain boots and house shoes, but you may also see it in sandals. Needless to say, this is a less precise way to fit footwear. European shoe sizes are different, starting at 16 and going to 30. Find out more about baby shoe sizes. Most of the complaints about beach shoes center around sizing because sizes aren’t very uniform. If you buy beach shoes online, allow time to return them before your beach vacation begins. Poorly fitting shoes can cause blisters, which is another common complaint from buyers. Most shoes will not rub blisters if the proper size is chosen. Occasionally, a shoe will have a defect in the construction, causing a rough spot that will irritate a child’s foot. If that occurs, you should be able to return the shoes for a refund. With all of this information in mind, it’s time to go shopping for the best toddler beach shoes! Who doesn’t know OshKosh, B’gosh! Now you can buy water shoes from the company known for quality clothing and reasonable prices. OshKosh Water Shoes are comfortable, lightweight and easy care. They don’t, however, provide as much support as some of the more structured shoes and thus aren’t as versatile. These are mostly for beach or poolside. OshKosh B’gosh was born in (where else?) Oshkosh, Wisconsin. Originally the company sold bib overalls of striped denim. When someone had the idea of making the overalls in kids’ sizes, the company started on its mission of manufacturing durable, well-made clothing for kids. Choice of Colors. OshKosh Water Shoes are available in a variety of colors. Easy Off and On. With the big Velcro-style strap and a locker loop on the back, these shoes are seriously easy to put on and take off. Most toddlers will be able to handle the job. Few Sizing Problems. Most buyers said the shoe fit as expected. Cutout Design. The cutouts not only allow ventilation but also keep the shoe from holding water or sand. Padded Insoles. Your child will love the comfort of the padded insoles. Rubber Soles. The textured rubber soles will keep your toddler from slipping on slick surfaces. Machine Washable. OshKosh water sandals are designed to be machine washed and air dried. Budget-Friendly. These shoes are in the low to moderate price range. No Half Sizes. 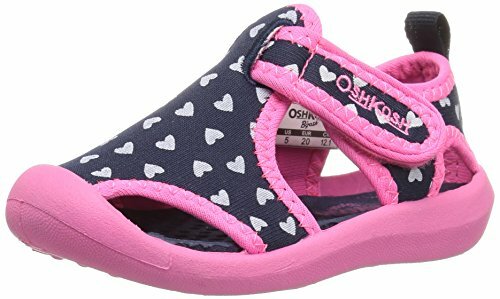 OshKosh water sandals are not available in half sizes. Toe Hole Issues. Some moms said that their children’s toes came out through the side holes and sometimes got stuck. As adult footwear, Crocs are sometimes disdained, but there’s no denying that on children they look adorable. There’s also no denying that their patented foam material, Croslite, is springy and comfy for both kids and grownups. Also, the shoes are almost indestructible. As beach shoes, Crocs Classic Kids’ Clogs have several advantages. There’s nothing to soak up the water, so they dry almost instantly. Sand rinses off easily, and there’s nothing to absorb odor, so there’s no musty smell. Crocs made their debut in 2002. By 2006 the company was being traded on the NASDAQ. The company website states that it has sold over 300 million pairs of shoes. Choice of Colors. Crocs are available in 16 different colors. Personalization Possible. Crocs can be personalized through use of the Jibbitz charms, which fit in the perforations of the shoe. Easy On and Off. Crocs are so easy to put on and take off that your child may be able to do it. Secure Fit. The heel strap keeps the shoe secure. Non-Marking Soles. Crocs’ soles are soft but don’t leave those ugly black marks. Big Toe Box. 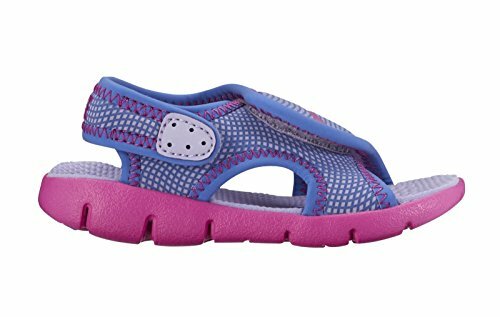 Your child’s toes won’t be cramped in Crocs’ generously sized toe box. Easy to Clean. Sand rinses off easily, and Crocs dry quickly. Odor Resistant. Croslite material does not retain odors. Breathable. Ventilation holes provide air circulation. Lightweight. Croslite material is super light and won’t soak up water, so the shoes remain lightweight. Warranty. Crocs are guaranteed against manufacturing defects for 90 days. No Half Sizes. The Kids Classic Clogs are available in sizes 4-13, plus some youth sizes, but they are not made in half sizes. Oversized. Some buyers stated that the shoes run big and create a hazard for children as the shoes don’t stay in place on their feet. Not Budget Friendly. Crocs are moderately priced. Crocs have been branching out from its classic clogs, and one of the results is this cute and practical water sandal. It features a sole of Crocs’ patented Croslite for comfort and durability. The toe bumper safeguards little piggies from rocks and other hazards. 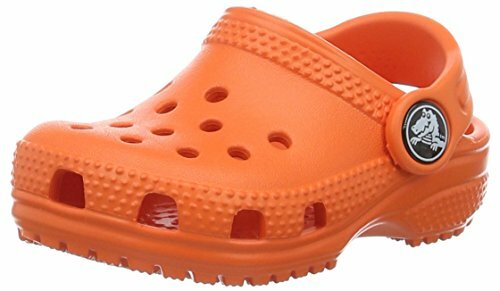 Available in colors that range from perky neon to basic neutrals, these Crocs are both functional and fashion-forward, for all of your child’s amphibious adventures. Crocs have nine models in its Swiftwater line, ranging from water boots to special versions of its classic clogs, but this sandal makes an excellent beach shoe. Choice of Colors. The Crocs Swiftwater Sandals are available in several different colors. Secure Fit. The heel strap keeps the shoe secure and allows for easy on and off. Non-Marking Soles. Crocs’ soles won’t leave black marks on your floors. Easy to Clean. Sandals rinse off easily and dry quickly. Lightweight. Croslite soles and mesh uppers add up to a lightweight shoe. No Half Sizes. The Crocs Swiftwater Sandals are not available in half sizes. Not Budget Friendly. Crocs Swiftwater Sandals fall into the moderate to high price range. 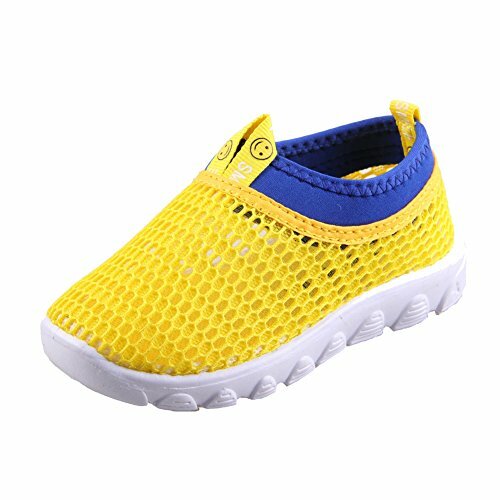 Advertised as a hybrid of a sneaker and a water shoe, this Dadawen shoe of breathable mesh will keep your toddler’s feet cool and comfy. Some moms said that this shoe put an end to their kids’ stinky feet! This company does not maintain its own website but instead sells through other online retailers. Product descriptions do not state where the shoes are made but do recommend that you order using the Dadawen size chart. Those who have bought the shoes report some sizing issues, but the shoes are such a bargain that many think they are worth the risk. Choice of Colors. The Dadawen breathable mesh sneakers are available in four bright neon shades with a cute logo. Easy On and Off. The shoes are elasticized so that they are easy to put on and take off. Secure Fit. A strap with a Velcro-type fastener ensures a snug fit. Few Sizing Problems. Most buyers said the shoe fit as expected, but some said the shoes run wide. Breathable. The mesh material allows for air circulation and quick drying. Machine Washable. Toss these shoes in the washing machine for easy cleaning. Odor Resistant. The ventilation means that children’s feet don’t sweat and get smelly. Lightweight. The mesh material makes these shoes super lightweight. Half Sizes Available. 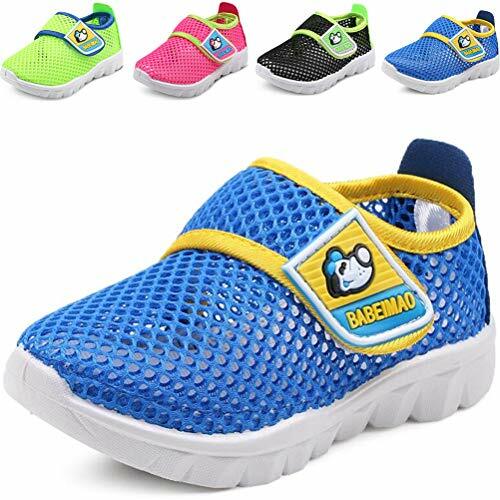 Dadawen breathable mesh sneakers are available in sizes 5-13, in both full and half sizes. Budget-Friendly. These shoes are low-priced, which is a great perk for seasonal shoes. Traps Sand. Some users said that sand gets into the shoes through the mesh and then collects in the bottom of the shoe. Sizing Issues. Some buyers had trouble determining the proper size for their children. Here’s the blueprint. Take a rugged rubber sole, top it with a spongy foam footbed, and then create a comfy, breathable upper. You’ve just made an outstanding shoe for the beach and other outdoor use. 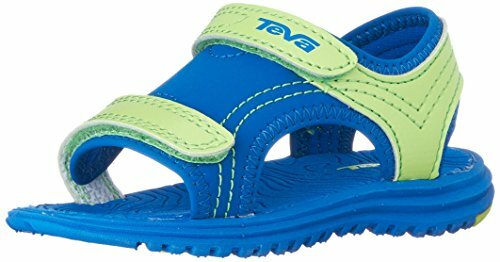 If you are an outdoors person, you may be familiar with the Teva brand, known for sturdy sandals. This toddler model keeps the toughness but adds some softer materials so your little one will stay comfy. According to the company website, the Teva brand was born in 1984, when a Grand Canyon river guide combined a flip-flop and two Velcro watchbands to make the prototype. Choice of Colors. The Teva website shows this shoe in olive, navy, and pink, but earlier versions of the Psyclone may still be available in a wider range of colors. Easy On and Off. Straps with Velcro-type fasteners mean that shoes are easy to put on and take off. True Sizes. The Teva website states that Tevas use true sizing, which means that you should be able to buy your child’s usual size. Breathable. Uppers are made of a breathable mesh for cool comfort. Cushioned Footbed. The footbed is made of EVA foam for comfort and long wear. Tough Soles. Psyclone soles are made of a very tough material for good wear, and they are ridged to give your child a good grip. Warranty. Tevas are guaranteed against manufacturing defects for a full year. Limited Sizes. 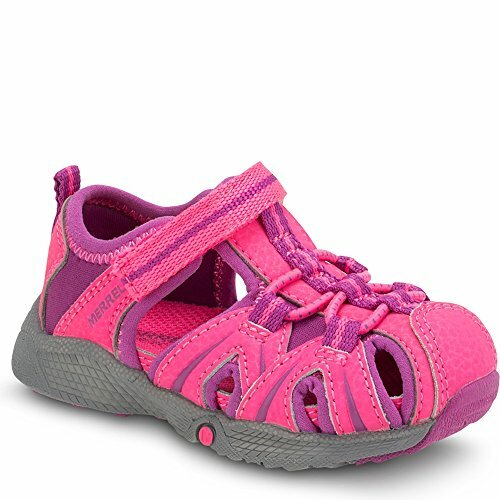 Teva toddler shoes are available in sizes 4-10 and are not available in half sizes. Problems with Blisters. Some moms reported that their children developed blisters in the toe area while wearing these shoes. Not Machine Washable. The manufacturer recommends scrubbing by hand and using a toothbrush to get into crevices. Not Budget-Friendly. These shoes are in the moderate price range. Lots of adults love Nike shoes, but you don’t have to be a grownup to be a fan of the brand. The Sunray is especially easy to put on and wear, just right for little Nike fans. With an assortment of cool colors and a big Swoosh right on top, the Sunray is one of the coolest beach shoes for toddlers. Nike is the largest maker of athletic shoes in the world. Choice of Colors. The Nike Kids Sunray Adjust 4 shoes are available in a range of colors and feature the Nike logo on top. Easy On and Off. Velcro-type fasteners mean that the shoes are easy to put on and take off. Comfort. Many buyers said that their children find these sandals very comfortable. Adjustable. Both the heel strap and the uppers have Velcro-type fastenings, which means that the snugness can be adjusted. Quick-Drying. Uppers are made of a quick-drying synthetic. Cushioned Footbed. The midsole is made of Nike’s patented Phylon for comfort and flexibility. Tough Soles. Patterned rubber bottoms provide good traction and won’t mark up floors. Warranty. Nikes are guaranteed against defects in materials and workmanship. Limited Sizes. These shoes are available in sizes 4-10 and are not available in half sizes. Run Small. All shoes generate some complaints about sizing, but many buyers said that these shoes run small. Hard to Clean. Some buyers said that the light-colored shoes are very hard to get clean. Not Budget-Friendly. These shoes are moderate to high in price. The Keen Seacamp II is a great shoe for toddlers, even if they are just going to camp in their own backyards. With the open construction of a sandal but with heel and toe protection, the Seacamp is a smart choice for active kids. It’s considered a hybrid because it is water-friendly but is sturdy enough for all outdoor play. The Keen brand began with the Newport sandal in 2003 and has been going gangbusters ever since. Keen is committed to three core values: giving back to communities, taking action and reducing its impact on the environment. It is especially vocal in supporting environmental causes and preserving outdoor places, such as national parks and monuments. Choice of Colors. The Keen Seacamp II is available in a dozen or so fun color combinations, some involving cute striped fabric. Secure Fit. The Keen Seacamp II has a bungee cord fastener plus one strap with Velcro-type closure, so it fits snugly with some capacity for adjusting the fit. Durable Uppers. Uppers are made of polyester for washability and durability. Water-Resistant Liner. The inner mesh liner is made of a hydrophobic mesh. Soles That Grip. A lug pattern on the soles ensures traction but won’t mark up the floor. Machine Washable. All Keen water sandals are designed to be machine washed and air dried. Warranty. Keens are guaranteed against defects in materials and manufacturing for a full year as long as the product is bought from an authorized dealer. Limited Sizes. 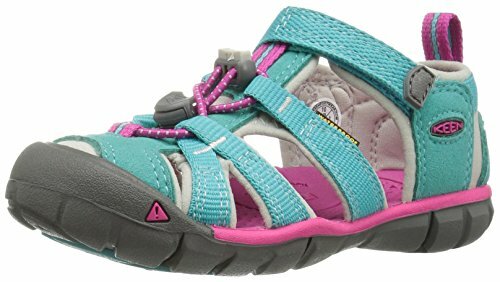 Keen Suncamp II sandals are available in toddler and bigger kids’ sizes, but they are not available in half sizes. Not Breathable. The open construction on the sides provides some ventilation, but most of the shoe is closed in. Smell. Because the shoes are largely closed in, your child’s feet will sweat. If your child tends to have stinky feet, these shoes can develop an odor. Not Budget-Friendly. These shoes are high in price. Like the Keen Suncamp II, the Merrell Hydro Junior is also great for outdoor wear, even if water is not involved. It’s one of the few water shoes to incorporate leather. Because the leather upper is lined with a quick-drying material, these still can be used as water shoes, but they will not dry as fast as many other models. When trained shoemaker Randy Merrell turned his talents to cowboy boots and then to hiking boots, an iconic brand was born. The first Merrell products came on the market in 1983, and since then the company has expanded into all areas of fitness footwear and has added clothing to the line. Great Choice of Sizes. Merrell Hydro sandals are available in sizes and half sizes and are also available in wides. Choice of Colors. These sandals are available in a choice of colors. Secure Fit. This shoe has a strap with Velcro-type closure, and stretchy cords add to the snug fit. Durable Uppers. Uppers are made of leather for durability with a fast-drying lining. Soles That Grip. Merrell’s unique M-Select GRIP system provides superior traction. Not Easy to Clean. The Merrell website recommends that its products be cleaned by hand. Not Fast-Drying. Although the lining is quick-drying, the leather takes a while to dry. Some Sizing Problems. Over a quarter of buyers said the shoe did not fit as expected. Smell. Some buyers said that their children’s shoes developed a bad smell. Not Budget-Friendly. These shoes are in the moderate to high price range. Here’s the i play formula for toddler beach shoes: simple pull-on design with a padded collar and giant loop on the back to make the tugging easy. Like other i play products, the shoes are manufactured to be free of harmful chemicals. The company specializes in natural products that promote learning. I play was founded in 1982 by Becky Cannon, a child development expert. She still runs the company with the help of her two daughters. Choice of Colors. These water shoes are available in five vibrant solid colors. Fast-Drying. The uppers are made of a combination of polyester fabric and mesh, for quick drying. Non-Slip Soles. These shoes have rubber soles with a textured bottom to prevent slips. Sturdy Uppers. The uppers are made of an extra-thick fabric, so the foot is protected and doesn’t slip around. Goes with i play Clothing. The shoes coordinate with outfits by i play, so matching is a breeze. Sun Protection. These water shoes offer 50+ UPF sun protection, so moms have one less thing to worry about at the beach. Budget-Friendly. These shoes are low in price. No Half Sizes. Water shoes by i play are available in sizes 4-10, but they are not available in half sizes. Not Easy to Clean. The i play website recommends that these water shoes be hand cleaned. Holds Sand. These shoes tend to hold sand in the bottom. No Size Adjustment. The shoes have no straps or ties to make the fit tighter or looser. Sizing Problems. A significant percentage of buyers said the shoe did not fit as expected. 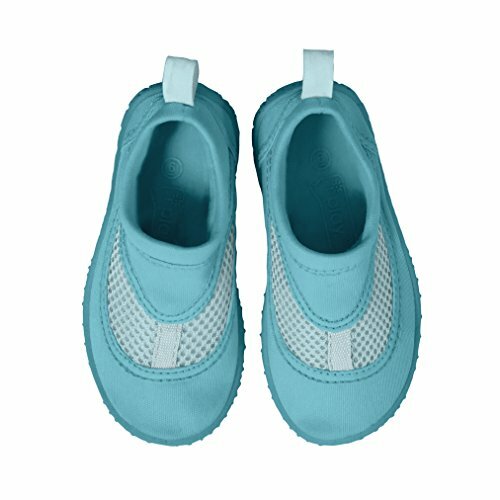 Another sneaker-water shoe hybrid, the Cior Kids Aqua Shoe features uppers made of breathable honeycomb-style mesh. These shoes will keep kids’ feet cool while offering good protection from hot sand and beach hazards. The Cior brand is associated with the Fantiny footwear company. This company does not maintain its own website but instead sells through other online retailers. Choice of Colors. The Cior Kids Aqua Shoes are available in a variety of eye-pleasing color combinations. Easy On and Off. The shoes are elasticized and have a pull tab in both front and back so that they are easy to put on and take off. Breathable. The mesh material allows for good air circulation and quick drying. Easy to Clean. The best cleaning method is not specified by the manufacturer, but users said these shoes were easy to clean. Thick Skidproof Sole. The soles are thick for good protection and cushioning and feature a skidproof design on the bottom. Odor Resistant. Generous ventilation means that children’s feet don’t sweat and get smelly. Lightweight. The mesh material makes these shoes lightweight. Half Sizes Available. These shoes are available in both full and half sizes. Budget-Friendly. These shoes are low-priced. Traps Sand. Some users said the mesh design allows sand to collect in the shoes. Sizing Problems. Over a quarter of buyers said the shoe did not fit as expected. Loose Insoles. Some buyers said that the insoles come loose and pop out every time the shoes are taken off. If you prefer simple, flexible water socks for your toddler, you’ll be thrilled with the cute selection offered by Jiasuqi. This product features a soft, stretchy top and a flexible rubber sole. These water socks will protect your little ones from hot sand and give them some extra traction poolside. They are not, however, sturdy enough for hiking or for playing on a rocky beach. Because the shoes are so lightweight, children can wear them while swimming. In the pool, they will protect little tootsies from rough spots on the surface. On the beach, they will guard against hot sand and small hazards. Because they are so soft and comfortable, some children enjoy wearing them as houseshoes or for indoor play. Jiasuqi is a footwear company that does not maintain its own website but instead sells through other online retailers. Choice of Cute Designs. 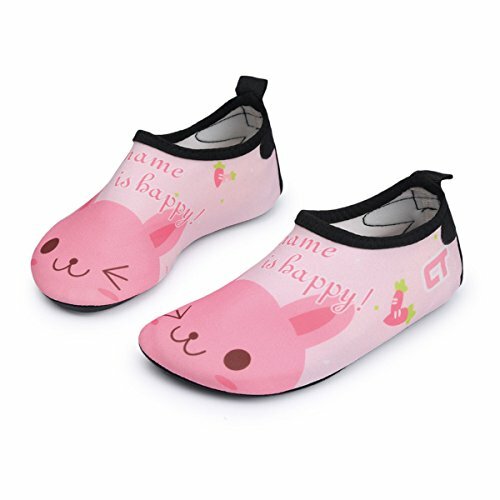 These water shoes by Jiasuqi come in a variety of adorable designs, mostly featuring animals and some with cute slogans, too. Fast-Drying. The uppers are made of a combination of polyester fabric and spandex, for easy fit and quick drying. Easy to Clean. Cleaning method is not specified by the manufacturer, but some users said these shoes are easy to clean. Non-Slip Soles. The rubber soles have a textured bottom to prevent slips. Flexible. These water socks have such flexible soles that they can be folded or rolled up for easy packing. Versatile. They can be worn in or out of the pool and are also great for shower shoes or houseshoes. Budget-Friendly. These water socks are low in price. Confusing Sizing. Sizing for these water socks is non-standard and a little hard to figure out. They are available in these toddler sizes: 3-4, 5-5.5, 6-7, 8-8.5, 9.5-10. Sizing Problems. Almost half of the buyers said the shoe did not fit as expected. No Size Adjustment. These have no straps or ties to make the fit tighter or looser. Sunville water shoes feature sturdy nylon construction and an elastic cord that allows you to draw up the uppers for a better fit. The rugged rubber sole offers good protection and non-slip grip. The shoe is designed with removable insoles for easier cleaning, but some moms do not like this feature as the insoles become another item to keep up with. Sunville is a footwear wholesaler with a manufacturing facility in China and a showroom in Toronto. Choice of Colors. Sunville water shoes are available in four color combinations. Easy On and Off. The adjustable cord and pull tab make the shoes easy to put on and take off. Secure Fit. The adjustable cord ensures a snug fit. Lightweight. The nylon material makes these shoe lightweight. Budget-Friendly. These shoes are low-priced..
Traps Sand. Some users said that sand collects in the bottom of the shoe. No Half Sizes. These water shoes are available in sizes 5-10 but only in full sizes. The best toddler beach shoe is the Crocs Swiftwater Sandal. It gets high marks for design, with holes to let water and sand out and a big bumptoe to protect tender toes. Very few problems have been reported with fit which is a big plus. Let’s face it: Having to return a shoe is a pain even if it doesn’t cost you a dime. The Crocs Swiftwater sandal gets high marks for durability, too. Also, Crocs is a name you can trust, with a website where you should be able to get answers to all of your questions. If your child only needs beach shoes for a few months in the summer, you might want to go with one of the cheaper shoes from a lesser-known brand. Choose the Dadawen if you want a sneaker-water shoe hybrid, the Jiasuqi if you want water socks your child can swim in or the Sunville if you want a basic water shoe. All should fill your needs, although you won’t have the quality assurances that you get with better known brands. If you need a sturdier shoe for a rocky beach, the Keen can’t be topped, but it does carry a hefty price tag. Still, the Swiftwater sandal by Crocs can’t be beaten for looks and performance. It’s an all-around toddler beach shoe that protects little feet and looks sharp, too.